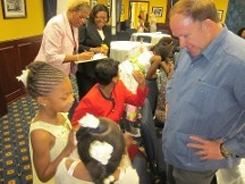 Embrace Girls take just another quick peak as they eagerly awaited their Tuesday Tea Guest, the Fly Jock himself, Tom Joyner. The Embrace Girls Foundation closed out the school year with it's signature event this week at the Miami Dade County School Board Building leaving Board representatives and their guests awestruck. "I cannot say enough about these very young girls and their grace, beauty and most important wit and intellect said, Perla Tabares Hantman, Chair of the Miami Dade County School Board and event host "this is one program we need to expand, nurture and sustain" she added after fielding dozens of questions from the girls who range from ages 5 to 16 curious about the Chair's interests from International and Social affairs to personal likes and the current state of Education in Florida. 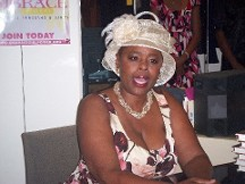 "I had already hosted a Tea with the girls and have been an advocate of the organization for many years so, I knew their work and International foot print" said Dorothy Bendross-Mindingall, Miami Dade County School Board Member for District 2 adding "when the Chair expressed an interest in the group we jumped at the opportunity show her up close and personal what's happening in my District" said a proud Board Member that resides over a District where many of the schools are failing, poverty pervasive and crime rampant. Amidst it all the organization provides during and after school academic, social life skills programs throughout the year reaching hundreds students particularly, elementary aged girls. 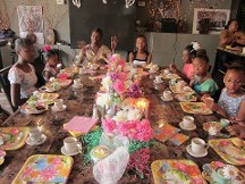 However, Tea Parties are the organization's signature event - a delightful setting where conversation surrounding a most beautiful setting lends an opportunity to showcase social, communication and etiquette skills learned by the girls as a result of their involvement in the program as well as more about the work and vision of the Guests. "I was shocked to hear my students discuss world affairs and be comfortably and poised doing so - this is exposure they will never forget and most never have the pleasure or privilege of experiencing" said, Dr. Cynthia L. Hannah, Principal or Arcola Lake Elementary School blessed she adds to be one of the schools the organization serves. A sentiment echoed by the Chair "I don't know another program like this... it's impact is obvious and our girls... all girls Countywide need it." Previous Tea Guests who have supported the organization include Former First Lady, Columba Bush, University of Miami President, Donna Shalala, Former Co-Host of the "View" Sherri Shepherd, Senior Executive Producer, of "Access Hollywood" Terri Macleod, Civil Rights Activist, Reverend Al Sharpton, Actresses, and Kim Wayans, Celebrity TV Court Show Judges, Lynn Toler, Glenda Hatchett, Marilyn Milian and Karen Mills-Francis, Presidential Candidate and Florida Senator, Marco Rubio and recently named Assistant Director of the United States Secret Service, Paula A. Reid to name a few. OMG! What an empowering day. Miami-Dade County Court Judge, Andrea Wolfson spends the afternoon with the Embrace Girls having a charming conversation over Tea. Wednesday, October 17, 2012. 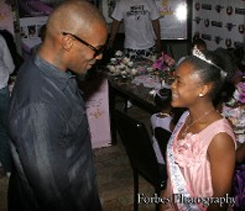 Embrace Girls Host All Star Tea Party On Thursday, May 12, 2011 With Cast Members Of Hit Stage Play, "Loving Him Is Killing Me"
Super Model, Tyson Beckford chats with Embrace member, 8 year old, Myla Smith as Soul Singer, Kenny Lattimore looks on. Super Model, Tyson Beckford holding Embrace Member, Kelis Waye, Soul Singers, Christopher Williams, Kenny Lattimore, Embrace Member, Jeanette Dawson and Promoter, George Crooks - toast to Embrace Girl Power! Women's Fund of Miami-Dade County CEO, Debi M. Harris Truly Embraces Girl Power! 4 year old Embrace member, Kelise Waye takes a quick look at Judge Karen Mills-Francis, newly released book "Stay In Your Lane"
Embrace Girls Spring Tea In Recognition of Women's History Month Featuring Attorneys from the Miami Dade Police Legal Division and Miami Dade County Police Benevolent Association. 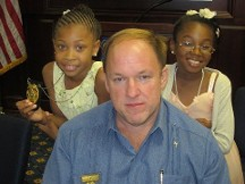 The Embrace Girls Foundation, Inc.